Also, there weren't any witnesses. Despite our intense dislike of his politics, Hope n' Change has at least held a grudging admiration for Bernie Sanders' apparent integrity and sincerity when it came to his wildly misguided beliefs. But (surprise!) it turns out he's been lying all along. Following a brief meeting with the president whose "favor the rich" financial policies represent everything Bernie allegedly hates, the crusty candidate has agreed to help Wall Street pin-up girl and financial racketeer Hillary Clinton win the White House in order to kill off the middle class once and for all. To accomplish this, Sanders is not only going to have to completely change his rhetoric to convince his enthusiastic young supporters to vote for the cackling candidate, he's also going to have to slip a heavy dose of rohypnol into their drinks. Which might at least spare them the memory of their political molestation when, and if, they eventually wake up. "This means those of you holding their breath for an indictment can give up and start breathing again. Obama wouldn't endorse a candidate that was on her way to the big house. No doubt, James Comey has already told his staff to take summer vacation early." Secondly, we want to remind readers that there's another great political blog we think you'll enjoy: The Daily Gouge. Follow the link and enjoy the fun! It's time for Bernie to stop Running and start running. Although the most recent round of Democratic primaries was held yesterday, perhaps the most interesting news was the Associated Press's report - a full day earlier - that Hillary had already magically netted all the delegates she needed to finalize her coronation as Democratic presidential nominee. The news came as a stunning surprise to Bernie Sanders and his supporters, all of whom share a charming naivete about how primary elections, the Clintons, the media, and the Democratic Machine work. There's even reasonably compelling evidence that the AP story was created in collusion with Hillary's campaign machine days earlier and specifically released just before the California primary to do the greatest possible amount of damage to the morale of Bernie's coterie of socialist sycophants. Frankly, from day one Bernie's supporters had a smaller chance of having their votes legitimately counted than the Americans under fire in Benghazi had a chance of Hillary sending troops to their rescue. In Hillary's world, the inconvenient are cannon fodder - and anyone standing between her and the White House is very inconvenient indeed. 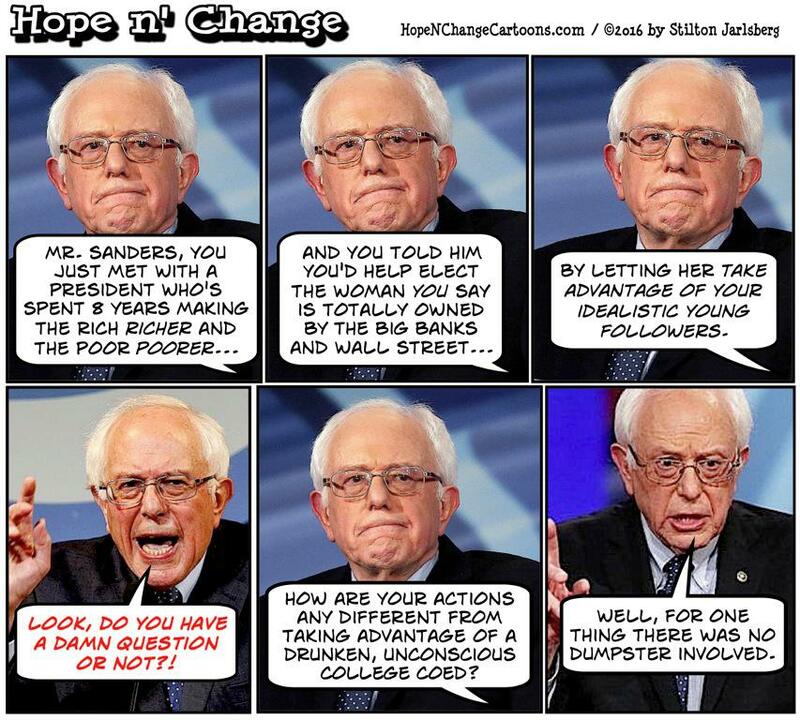 There now appears to be little question that Hillary has made the necessary backroom arrangements to take Bernie out of the running (and if he gives up soon, his odds of not becoming room temperature will skyrocket). Which frankly makes us think that it's Joe Biden's secret service detail which now needs to be on their toes. Hillary's current best bet to avoid indictment is to assure that the Democrat party will have no "plan B" waiting in the wings. And if that thought doesn't have Biden wearing kevlar BVDs, he's even more clueless than we thought. Meanwhile on the Republican side, politicians who've been carefully tiptoeing toward Donald Trump to give him the smallest endorsement possible are now falling over themselves to run from him after his purely ethnic attack on the judge hearing the Trump University lawsuit. Despite the fact that the judge was born in Indiana (making him exactly as American and Hoosier as your faithful author), and despite the fact that Trump swears that Hispanics love him, he has declared the judge (descended from two Mexican parents) to be a Mexican himself, and therefore incapable of giving a fair trial to Trump. By The Donald's logic, this means that in the future all defendants should have a judge who shares their own race, ethnicity, and beliefs. In other words, Trump would like to see segregated law - including, we assume, Shariah Law for any Muslims he doesn't throw out of the country. Hope n' Change will never, ever vote for Hillary Clinton. But if Trump wants our vote in November, he needs to STFU right now and keep his moronically offensive ideas to himself until election day. The Biden curse strikes again. In a cruel twist of fate, the celebratory mood we all feel on this first day of Ramadan has been darkened by the passing of America's most beloved Muslim, Muhammad Ali (not to be confused with Muhammad every other Muslim). Born Cassius Clay (after his parents rejected the name Pontius Play-doh), Ali bravely outed himself as a pugilist at a time when a heavily-segregated society did not even accept the idea that pugilists deserved their own bathrooms. He later blazed a trail through the world of heavyweight boxing, his record marred only by the brutal beating he gave the gentle inventor of the George Foreman grill. Over the years, Muhammad Ali came to be known as much for his whimsical eloquence as his thundering fists, coining such unforgettable phrases as "I'm the Greatest," "Hell no, I'm not going to Vietnam," and "Float like a butterfly, Sting like Paul Newman and Robert Redford." In all seriousness, Ali was a true cultural icon in a time when celebrity was actually predicated on achievement. He was both larger than life and all too human in his failings (politically, we agreed with him on very little). That being said, he was one of a kind and will be missed. Tomorrow, voters in California's Democratic primary face the toughest choice since "defecate or go blind" - specifically, whether to vote for Hillary "What Does It Matter" Clinton or Bernie "Want To Feel This?" Sanders. Oddly, this is considered a surplus of political riches in California. Both candidates are considered to be so perfect and so evenly matched that experts say the race will be decided by a tiny percentage of Progressive voters who are torn between wanting a candidate with a demonstrable history of pap smears versus one who assures four years of Larry David appearances on Saturday Night Live.